Had it not been for NOTA, the Congress in all likelihood would have won with a majority to form the government, say analysts. GANDHINAGAR: The Gujarat Assembly elections saw not only a marked increase in None Of The Above (NOTA) voters, these votes also played a significant role in deciding the results. Many wins of the BJP were very thin, and in these seats the NOTA votes were more than the victory margin. Of the total 1,50,19,245 votes cast in the 2017 Assembly elections, almost 1.8 per cent -- or 5,51,414 voters - pressed the NOTA button on the Electronic Voting Machines. In Ahmedabad's Dholka constituency, BJP cabinet Minister Bhupendrasinh Chudasama won with just 327 votes over Congress' Ashwin Rathod. The third highest voter getter was an independent Shaktisinh Sisodiya with 4,222 votes, but the spoilsport for Congress was NOTA with 2,347 votes. In Khambhatt constituency, BJP's Mahesh Rawal won, leading with 2,318 votes against Congress' Khushmanbhai Patel. Here the third highest votes went to NOTA with 2,731. In Visnagar, BJP's Rushikesh Patel won by a lead of 2,869 votes over Congress' Mahesh Patel, and the third highest votes went to NOTA - 2,992. In Fatehpura constituency, BJP candidate Rameshbhai Katara won with a lead of 2,711 votes over Congress' Raghubhai Machhar, with NOTA being the third highest vote getter with 4,573 - far more than the NCP candidate who got 2,747 votes. In Matar constituency, BJP's Kesharisinh Solanki won with a margin of 2,406 votes over Sanjaybhai Patel of Congress, where the third highest was NOTA with 4,090 votes, far more than the independent candidate who bagged 1,936 votes. In Himmatnagar constituency, BJP's Rajendrasinh Chavda beat Congress candidate Kamleshkumar Patel by 1,712 votes, with NOTA again getting the third highest votes at 3,334, while the fourth was the BSP candidate. In Porbandar there was a battle between two bigwigs, BJP's sitting MLA and cabinet Minister Babubhai Bokhiria who won over senior Congressman Arjun Modhwadia with a thin margin of 1,855 votes. The third highest vote chunk went to BSP candidate (4,337) but the NOTA votes were 3,433, just enough for Modhwadia to have got the coveted seat. 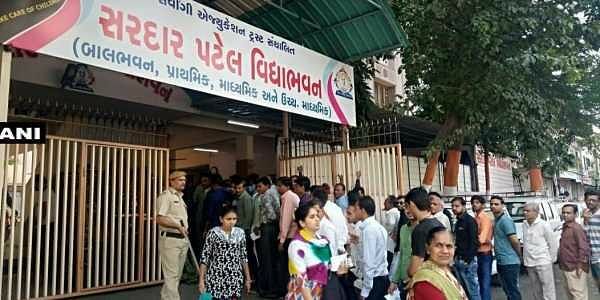 The Umreth constituency was grabbed by BJP candidate Govind Parmar over Congress' Kapilaben Chavda with thin margin of 1,883 votes, where the third highest vote chunk was NOTA (3,710) - more than what the fourth-placed independent got(1,286). The Rajkot rural seat was taken by BJP's Lakhabhai Sagathiya with a narrow margin of 2,179 votes over Vashrambhai Sagathiya from Congress. Although the third highest vote getter was the BSP candidate (3,323), NOTA grabbed 2,559 votes. Another bigwig from the BJP who narrowly won with a thin margin was former cabinet Minister Saurabh Patel (Dalal) from Botad seat. He won with a margin of 906 votes over Congress' Dhirajlal Kalathiya. The NOTA votes were 1,334. The Congress rebel who defected to the saffron party before the Rajya Sabha elections, C.K. Raulji, won with a slim margin of 258 votes over Congress rival Rajendrasinh Parmar. Here NOTA votes were 3,050. In seats like Sanand, Gariadhar, Deesa, Sayajiganj (Vadodara), Chanasma, Mahuva (Surat), Vijapur, Gandhinagar (south), and Kheralu that were won by BJP candidates with narrow margins, the independent candidates made a huge dent in votes of the Congress candidates.